Map of Brazil and Guiana. This is a beautiful example of Rand McNally and Company's 1892 map of Brazil and Guiana. It covers from the Orinoco River in Venezuela to Do Sul, including British, Dutch and French Guiana. In inset in the lower right quadrant details the western portion of Brazil. Part of neighboring Bolivia Paraguay, Argentina and Uruguay are also featured. 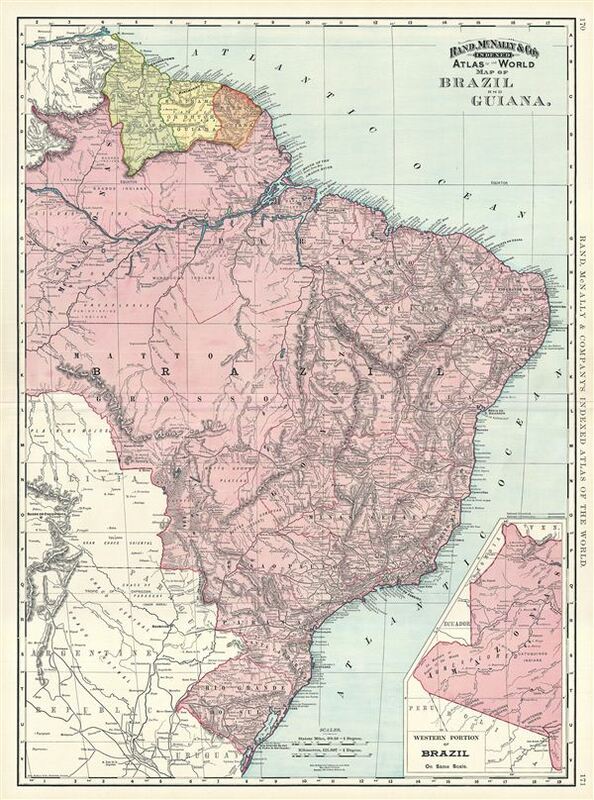 This map was printed shortly after Brazil was declared a Republic following the abdication of Emperor Pedro II. Several Indian tribes are identified throughout. The Marshes of Xarayes are also identified. Color coded according to countries, the map notes several towns, cities, rivers, mountains, and various other topographical details with relief shown by hachure. This map was issued as plate nos. 170 and 171 in the 1895 issue of Rand McNally and Company's Indexed Atlas of the World - possibly the finest atlas Rand McNally ever issued. Rumsey 3565.046 (1897 edition). Philip (atlases) 1026 (1898 edition).